Water based cleaning agents have an optimal effect when their components are regularly monitored, carefully dosed and their concentrations are kept stable. This assures not only stable parts cleanliness but also increases the economic efficiency of cleaning processes. Water based cleaning agents consist of the components builder and surfactant either combined as a full cleaner or a modular cleaner system. Surfactants are surface active substances that, due to their composition of hydrophilic and hydrophobic groups, adsorb onto the interfacial surfaces contamination – water, part surface – water or the water surface. 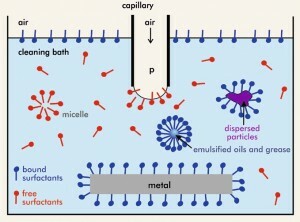 The surfactants wet the oil films on the part surface. The oil film is pushed together until oil drops form. Those oil drops can be easily detached from the surface. Solid particles that are embedded into the oil are removed as well. The cleaning process is supported by turbulences (spray cleaning, ultra-sonic, movement) and contamination is flushed away. The builder boosts the cleaning process. When alkaline cleaning agents are used, cleaning processes are supported by the detachment of particles as negative charge is forced upon part surface and contamination because of the high pH- value of the cleaning solution. The cleaning agent components are complementary in their effects. They dissolve the different contamination and stabilize them within the cleaning medium. Due to adsorption on the part surface they prevent further contamination in the cleaning process. The concentrations of builder and surfactant are not only changed by consumption but also by the carry-over in the part flow, the discharge of the bath preparation (e.g. ultrafiltration, oil separator) and the dilution via return of rinsing water. 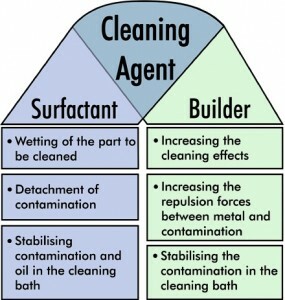 Both cleaning agent components are consumed to a varying degree. To assure sufficient parts cleanliness for follow up processes it is essential to stabilize both components within the predefined concentration range. 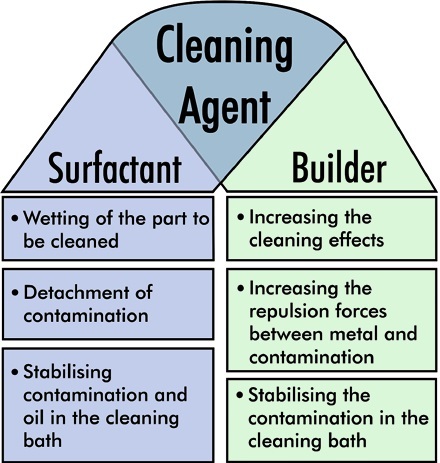 Often the dosing of the cleaning agent components is carried out in a fixed proportion based on the builder concentration that was determined by the titration of the alkalinity. This proportion is determined when running in the cleaning process or by the supplier of the chemicals. It does not consider the variety of contamination on the parts. This type of dosing often leads to surfactant depletion especially with the drag in of oil. To extend the lifetime of cleaning processes bath care measures are used. Ultrafiltration causes not only the removal of oil and contamination but also the filtering of parts of the surfactants. Low-foaming spray cleaners are used to remove the oil phase, but also remove surfactants in the process. This leads to surfactant depletion. The same effect occurs, if dosing according to consumption is not carried out duly. The result of surfactant depletion due to the lack of bath monitoring is insufficient parts cleanliness which often causes the production of rejects in cleanliness critical follow up processes such as bonding, welding or coating. To prevent this, the surfactant is overdosed in numerous cleaning processes due to safety aspects resulting in high carry over into the rinsing baths. Frequently, cleaning agent residuals remain at the part surface which could have a negative effect on subsequent processes. In practice the bath lifetime is often determined based on experience. An increased rate of defects in follow up processes will be used as an indicator to change the bath solution. The real reason for the insufficient parts cleanliness is the surfactant concentration dropping below a critical threshold. The lack of bath monitoring results in utilising a new bath solution instead of dosing according to consumption. Bath monitoring as well as dosing of surfactant and builder based on measuring values assure stable parts cleanliness. An effective way for monitoring the surfactant is measuring the surface tension with bubble pressure tensiometers. The surface tension is determined by measuring the inside pressure of a bubble in a liquid. The reference value for measuring the surface tension is the water value of 72.8 mN/m at 20°C (substance constant). The combination of the surfactant concentrations is realized with reference characteristic curves that are saved within the device. The surface tension shows the concentration of free surfactants that determine the cleaning power. 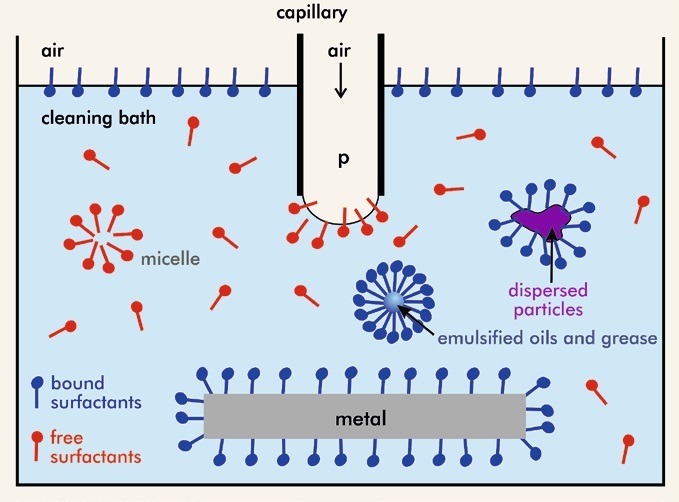 Active surfactants that are not bound to contamination such as oil or particles attach to the bubble and change the bubble pressure. The current cleaning power can be monitored by measuring the surface tension because only free surfactants are available for the cleaning mechanism. Changes can be identified immediately and replenishment can take place in time. Over dosage with stronger surfactant depletion into rinsing baths is prevented. With the handheld DynoTester+ bubble tensiometer, cleaning and rinsing baths are easily controlled and fast enabling the required surfactant dosage to be determined reliably. For continuous process monitoring and dosing surfactants according to consumption a process tensiometer (clean line ST) is used which features self-monitoring as well as fully automated cleaning and calibration and therefore, assures high process reliability. Monitoring the surfactant component of the cleaning agent with bubble pressure tensiometers assures stable parts cleanliness due to consumption dependent replenishment of the cleaning agent components. By extending the bath lifetime and using the cleaning agent according to consumption economic efficient process management is optimised. For further information on the DynoTester+ and other bubble pressure tensiometers please contact us or visit the web page.